A native of Miami, Mike played high school soccer at Miami Springs Senior High. He started every game of his high school career and was team captain his senior year for the #1 state-ranked Golden Hawks. He was drafted by the American Soccer League Defending Champions New York Apollo out of high school but opted to play college soccer for Perennial Soccer Power at Southern Connecticut State University (SCSU), where he played in four NCAA championships. The Fighting Owls of SCSU were consistently ranked #1 nationally during Mike's time with the team. Many of Mike's teammates and coaches are now coaching in the Major Soccer League, NCAA Divisions I and II, Brazilian Sports Authority, Maccabi Games, and the US Women's National Team. 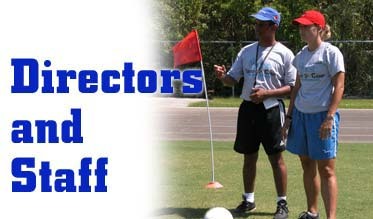 Mike has also coached youth soccer at the Optimist, DYSA, AYSO, and YMCA leagues in Dade County. Mike is married, has three children, and lives in South Dade. As a triathlete through high school, Jason played football, soccer and track and field for the Westminster Christian Warriors. Jason was captain of the boys soccer team his junior and senior year. He is the only three year recipient of the Most Valuable Player award in soccer in the school's history (1996,1997,1998). Jason was the captain of the 1997 Florida State Championship AYSO under 19 team. He was also the leading scorer for that Championship team. Jason will be entering his second year as the Head Varsity Girls soccer Coach at Westminster Christian School, after serving 5 years as assistant coach. Most notably Jason is the CEO and founder of Quest Sport® the regions newest soccer supply company. Tim Shea, Camp Coordinator, is an assistant coach with the Barry University Buccaneers. In addition to his duties with Barry, he has been the head boys coach at Miami Spring High since 1999. Prior to MSHS, he was the head coach at Southridge and an assistant at Braddock. He was named Dade County soccer coach of the year in 1996 with the Spartans. Tim graduated from Wofford College in South Carolina in 1982, where he was a four-year starter and three-time captain with the Terriers. He was named NAIA All-District 6 three times and once NAIA All-South Region. Donna Holyman was an assistant coach at the University of South Florida, working with all aspects of the program including recruiting, planning practices and games, and NCAA compliance. She spent six years as an assistant coach at the University of Kansas. She was primarily responsible for all aspects of recruiting for the KU soccer program. She was instrumental in bringing highly-regarded incoming classes to Kansas. A top player at both Hartford and Colorado as a collegian from 1994-97, she started all 74 games of her career, scoring 27 goals with 17 assists. She led the Hawks to back-to-back North Atlantic Conference titles and consecutive NCAA Tournament appearances before transferring to Colorado as a senior. In her one season in Boulder, she paced the Buffaloes with six goals and four assists in 18 games that season. In addition, her playing experience included stints with the Under-20 Canadian Women’s National Team and the U-23 Ontario Team which competed in the 1993 World University Games. Holyman, a native of Burlington, Ontario, received her bachelor’s degree in sociology from Colorado in 1998. She earned her master’s in education (sports administration) at KU in 2004. Holyman has her “C” license from the United State Soccer Federation. She worked as a staff coach with Kansas girls ODP in 2005. Chris Deno has been a member of the Quest Soccer Camp staff the past two years where he worked at both the Palmetto Bay Camp as well as the Virginia Gardens Camp. Chris is a valuable asset to the Quest Soccer Camp. Chris also found time in his busy schedule to be a part of the Quest Net Assault Camp staff. Chris is finishing his senior year with the Tennessee Wesleyan University Bulldogs. As a second year midfielder, Chris transferred to the Bulldogs from Georgia Perimeter Junior College where he led the Jaguars to two consecutive National Junior College Athletic Association Division 1 Championships. Chris was a standout player at Miami Springs Senior High where he garnered All County Honors en route to his selection to the All Miami Dade County Team. Stephanie De Souza has been with the Quest Soccer camp since 2007. At only 17 years of age she was selected as a member of the 2006 CONCACAF Under 20 Trinidad and Tobago National Team. In the fall of 2007 she became a key midfielder during her freshman year with Emory University She appeared in all 18 games for Emory, she scored the game-winning goal during Emory’s 2-0 win over Maryville University..
Stephanie played for four seasons on the Gulliver Preparatory Women's Soccer Team. She was a two-time Miami Herald Player of the Year (2006 and 2007),First Team All-Dade County from 2005-2007, and she was named the team MVP in 2006 and 2007. Stephanie was an All-State player in high school. She played for the Miami Premier club team. Heather Walton has been with the Quest Soccer Camp for the past two years and has been an integral part of the success of the Quest Soccer Camp. Heather was a four year varsity soccer letter while at Gulliver Preparatory in Miami. She received All-Dade Team honors as a freshman, sophomore and senior. Heather enters into her junior year with Philadelphia University, she saw action in 11 contests for the Lady Rams as a true freshman...Her first collegiate goal was the game-winner in a 2-1 victory over Millersville University...She also scored the tying goal in the CACC championship game against Holy Family University. Justin Corrado, a coach at Barry University, is in his second season as an assistant coach with Quest Soccer. He was a standout goalkeeper at Rollins College where he graduated in 2003 with a bachelor’s degree in economics. At Rollins, Corrado earned NSCAA All-America and First-Team NSCAA All-South Region honors in goal. He was a three-year starter and a two-time All-SSC selection. He is currently second on Rollins all-time list in goalkeeper saves and games played. Corrado has experience coaching at Central Florida United and at the AJAX Orlando Youth Academy. At Barry, he will work primarily with the Bucs’ goalkeepers. He is currently working towards his master’s degree in business administration at Barry’s Andreas School of Business. Originally from Connecticut, Corrado is a graduate of South Lake High School in Orlando, Fla.
Ken Petres joins the Quest Soccer Camp this year. Ken initially began his relationship with the Quest Soccer Camp in 2004 when he introduced his soccer-training device “The Ultimagoal” to our Quest Soccer campers. Ken is a former professional player who played in Europe. Ken was also a four-year letterman with the University of Wisconsin-Green Bay. Currently Ken is the former girls assistant coach at Westminster Christian School. The Quest Soccer Camp was the initial launching point of the Ultimagoal and will be featuring it again this year in our curriculum. Christian Sampson made his Quest Soccer debut in 2004. A former Nigerian standout player who was invited to train and play with the Enyimba team in Nigeria, Christian enhances the camaraderie and technical aspects of the game. Christian spends most of his summer traveling between his commitments to Quest as well as his own soccer camps in Detroit, Michigan. Adolofo "AJ" Diaz, a standout soccer player at Miami Springs Senior High School, was selected twice to the All Miami-Dade County soccer team. Aside from hiss soccer skills, AJ is a premier field goal kicker, and earned all county status for football. AJ is a former field goal kicker for the University of Alabama, and has played semi-professional soccer in the adult leagues of Miami, and is in his second year as a Quest soccer instructor. Michelle Casadevall, in her third year with Quest,and is in her third year with FIU Soccer. She was a four year soccer letter winner for the Vipers who was also a first-team All-Miami-Dade County performer, team MVP and a county all-star as a senior...scored 10 goals and added three assists in 2006 as a utility player at Varela...named the team’s Best Offensive Player and second-team all-county as a junior...first-team all-county and an honorable mention all-state competitor as a sophomore and Freshman of the Year and honorable mention All-Dade in 2003...helped the Vipers to the 2003 GMAC and 2004 district championships. Hadi Azadi, a former European player and former member of the Iranian Junior National Team. Hadi brings a vast tactical knowledge of soccer to Quest and is known for his strong play and quick decisions in tight situations. Hadi is a long time fixture in the South Florida adult leagues and is a tremendous asset to the success of the Quest Soccer Camp. Hadi is also a former youth coach in the YMCA leagues of Miami . Andrew Crichlow, a recent addition to the Quest Soccer Family in 2005, was born in Trinidad, and moved to the United States in 1992. A WCS grad, Andrew was an All Miami Dade County selection in both Soccer and Track and Field. Andrew was voted twice as a Soccer MVP at WCS . Andrew is a former United States Marine and is attempting to get on with one of the World Indoor Soccer League teams or the inaugural A league team Miami FC.